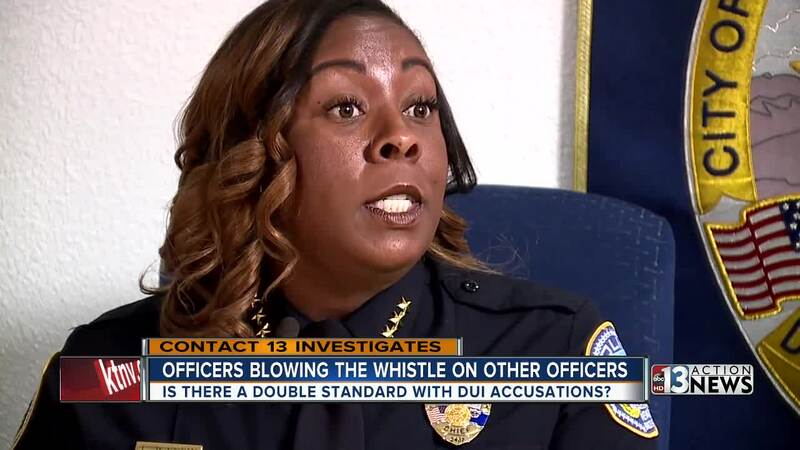 Henderson Police Chief LaTesha Watson spoke to Darcy Spears about her investigation into officers who broke the law but were not held accountable. We discovered this story in a unique way. Cops came to us with information on police officers who were caught breaking the law but weren't being held accountable. Is there a double standard for law enforcement when a cop gets caught driving under the influence? "There is no valid excuse for driving under the influence--I don't care who you are or who you think you are! There is none," according to Sandy Heverly of Stop DUI . Five Henderson cops were arrested for driving under the influence. All but one of them still work for the department. Two of them were received promotions after being convicted. "What the few have done, it impacts the many." That's what Henderson Police Chief LaTesha Watson told us when we asked her if it's a problem that needs to be fixed. "Oh yes. Fairness and consistency has been missing. That picks away at morale within an organization also. And that's something I have to eliminate," Watson explained. The most recent Henderson Police officer to be arrested for DUI is Todd Rasmussen. His alleged crime is the only one that happened on Chief Watson's watch. A former department spokesperson, Rasmussen is now a police background check investigator. He's been on paid administrative leave since May 18 when sources say he crashed his personal car into a light pole causing thousands of dollars in damage. Rasmussen pleaded not guilty. His trial for charges of failing to maintain his lane and misdemeanor DUI is scheduled for August 30. He declined our request to comment on this story. "When you have police officers who choose to break the law it casts a very dark shadow on all the extraordinary officers that are out there serving the public, putting their lives on the line for us every day," Heverly added. Chief Watson agrees that cops must be held to a higher standard. "We have the liberty of taking someone's rights away. We can put them in jail. Their freedom is gone. Us doing the same thing that we are arresting the public for is not good." In September of 2012, undercover detective Rand Allison was charged with DUI. Sources say he was driving under the influence in his detective car. Allison got the charge reduced and was found guilty of reckless driving. The result was similar with other cases we examined. Lisa Mattingly and Eron Bushell were also arrested for DUI. But you won't find it on their records. Both pleaded no contest to reduced charges of reckless driving. Both of them received promotions after their convictions. A member of the public might lose their job with a DUI or maybe not get a promotion, but someone on the police force does it and they're moving up the ranks. So how does Chief Watson address that disparity? "I am aware of some the incidents that you named as well as other incidents of alleged misconduct of employees who work here or no longer work here. The main thing that I've said to all of my employees is that I still can't speak for previous leadership," Watson said. Court records show that Bushell was arrested for DUI in 2007. He refused to take a field sobriety test after he was found passed out at the wheel in the northbound travel lanes of Blue Diamond at Dean Martin. He was an officer at the time and has since been promoted to sergeant. Mattingly was a sergeant when she was arrested for DUI in 2013. The arrest report shows that she rear-ended a citizen at a red light on Gibson and Horizon Ridge. Tests showed a blood alcohol content of .179 which is more than twice the legal limit. She pleaded no contest and was found guilty of reckless driving in 2015 and was promoted to lieutenant in 2017. Of the five police officers we investigated, the only one who lost his job is Joseph Lawrence. In 2014 he drove the wrong way on the 95 freeway and evaded police before stopping. Police records show he had a loaded gun with a round in the chamber, an open container of whiskey and lots of prescription pills in his car. Lawrence pleaded no contest to misdemeanor DUI and guilty to the felony of evading police. He was sentenced to probation. "If we have found that officers have alleged wrongdoing and if we found that they are guilty of that, they must be dealt with and dealt with in the appropriate manner or it causes distrust in the community. And that is something in this line of work that we cannot stand. The public has to feel that they can trust us--and trust us to do the right thing," said Chief Watson. We left messages for all of the current Henderson Police officers mentioned in this story but none of them returned our calls.